What's one of the best parts about eating out? It's gotta be the bread basket and flavorful olive oils that come with it. Admit it: You could make a whole meal on just crusty bread and olive oil. 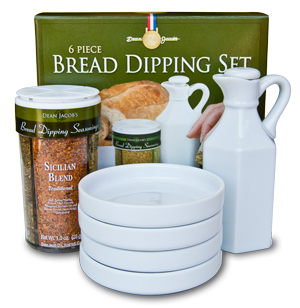 Now you can indulge your devotion with this 6 Piece Bread Dipping Set. The set includes four porcelain dishes, a porcelain oil cruet, and four different Italian seasoning blends! The seasoning blends include Sicilian (onion, garlic, and bell peppers), Parmesan (rich Parmesan cheese flavor), Tuscany (sun-dried tomato and basil) and Rosa Maria (rosemary, garlic, salt, parsley, thyme, oregano, and black pepper). Just pour two tablespoons of your favorite oil in one of the porcelain dishes, add a tablespoon of one of the seasonings, mix and let the flavors infuse for a few minutes.